We are very lucky to have some fantastic volunteers working with our collections team on our archive and book collections. Ann is one of our regular volunteers who is helping to number our enormous and ever-growing book collection; so far, the books numbered by Ann are in the thousands and span a large number of our collections. Not only is she a pro at wielding a 2B pencil but she is also our star at crafting purpose-made archive-standard wrappers for board books and a regular face at our Carnegie and Kate Greenaway shadowing groups. Ann wrote us an account of her experience with our books from the Lit and Phil Collection which consists of books withdrawn from the Literary & Philosophical Society in Newcastle. Volunteering for Seven stories you never know when the unexpected is going to hit you and send you spinning back in time to your own childhood. My task was to number children’s books from the Lit & Phil Collection. I had expected it to contain the usual classics Ivanhoe, Robinson Crusoe, even What Katy Did but here were Sue Barton, Student Nurse by Helen Dore Boylston, Return to the Wells by Lorna Hill and The Young Traveller series. The cover of the Young Traveller in Greece by Geoffrey Trease immediately transported me back to Berwick-upon-Tweed children’s library in the 1950’s eagerly clutching the latest arrival in the series. At a time when international travel was rare, here was a way to lose oneself in the life and culture of other worlds. Other discoveries among the Lit and Phil gems were the composer series by Opal Wheeler and Sybil Deucher published by Faber and Faber which told the lives of composers such as Haydn, Mozart and Schubert amongst others, interspersed with extracts from their music. These were presented in an attractive way, informative but not condescending. 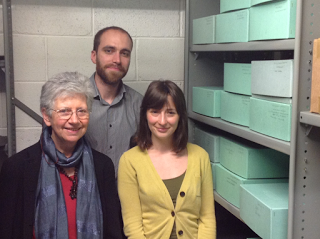 Back in February something quite exciting happened at the Seven Stories archive. Late one evening, after a long drive, dozens upon dozens of crates and boxes found their way into our archive from Beverley Naidoo’s house. Beverley wrote about the experience in her blog, where you can see some of the collection in its natural habitat and can catch a glimpse of our Archivist, Kris, and Collections and Exhibitions Director, Sarah, preparing the files for their long journey to Gateshead. Since that day in February I have been sorting, re-packaging and cataloguing everything that Beverley gave us. The collection spans Beverley’s career from her academic work, to her first and most recent novels. Luckily for me, Beverley’s collection has been quite easy to catalogue; I can confirm that she is quite an organised author. Beverley labelled up a lot of her files in detail so I knew exactly where to start and how to order everything. All of the papers have been re-housed into archive boxes and I’ll be replacing her colourful folders with acid-free (but cutting out and keeping all of her helpful labels). Repackaging in progress; some of Beverley's originals files for The Other Side of Truth. Beverley’s collection gives a perfect snapshot into her writing process but also gives an insight into the impact of her novels. Letters sent to Beverley from children (and adults) from all over the world span from the late eighties to 2014 and fill approximately six of our archive boxes; these letters are fascinating, they offer an overview of attitudes to race and diversity over three decades and show just how moving and thought provoking Beverley’s novels are. The whole team at Seven Stories have been enthusiastic about Beverley’s collection and before I’d even managed to get everything unpacked and into archive boxes our education team were looking for original material to use in a school project with Shotton Hall Academy. A lucky Year 8 Drama class developed a play about Beverley’s Journey to Jo’burg, and looking at the original drafts, illustration and research materials became part of their writing process. Our Learning Manager, Debbie, and I took a couple of boxes of Beverley's Journey to Jo’burg material to Shotten Hall and let the students look at and discuss the material. The students also had a chance to talk to Dave Temple who, as a local miner, was involved in anti-apartheid by supporting South African miners. It was great to see the students and Dave so engaged with the archive, it created some great discussion points about the reality of the apartheid and human rights. I was even asked questions about archive conservation! The big performance took place at the beginning of June and both Seven Stories and Shotton Hall were host to a very special guest. Kris and I with Beverley and her collection in our store. It seemed fitting that Beverley should visit our Collection team and see her archive in situ before heading to Durham to watch the play it inspired. We spent the morning chatting to Beverley, her husband Nandha, and IBBY president for Palestine Jehan Helou, it was great to show them some material from other collections. They discovered familiar faces in photographs from the Elizabeth Laird collection and I think we managed to convince them that Beverley’s archive is in good company at Seven Stories. Hopefully Beverley’s will be a collection that continues to grow. We see huge opportunities to use it in educational programmes and hopefully it will generate a lot of research interest. It has certainly sparked many discussions between our staff and volunteers. The whole experience has been a wonderful example of how our archive collections are currently expanding and how our collections can be used to inspire and educate. The acquisition of Beverley's archive is part of our 'Collecting Cultures' programme and, over the coming months there will be news of other exciting additions to the Seven Stories Collections. 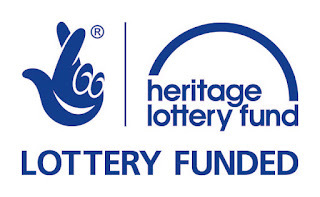 Seven Stories was able to support the acquisition of the Beverley Naidoo collection through support from a Heritage Lottery Fund ‘Collecting Cultures’ grant. This has been awarded to Seven Stories in recognition of the museum’s national role in telling a comprehensive story of modern British children’s literature. 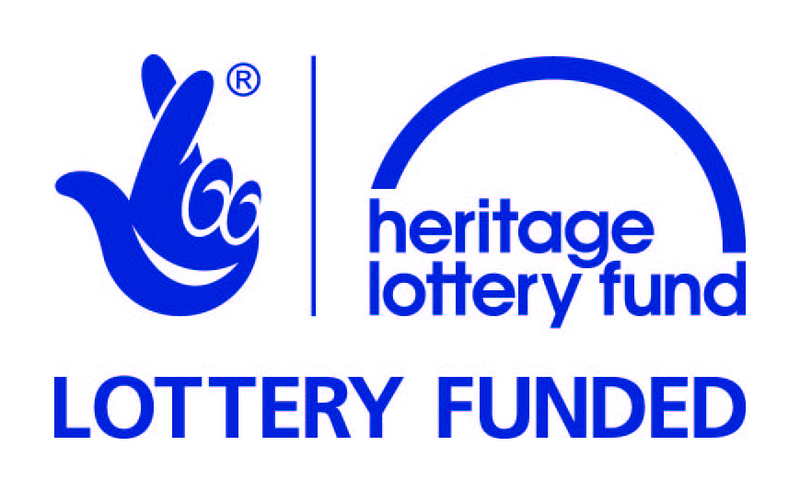 For more information on our HLF Collecting Cultures project see: http://www.sevenstories.org.uk/news/latestnews/hlf. This month our feature animal is a particular favourite of this blogger*, we are going to be raving about rabbits! We will again, take a look at an illustration, archival item and a book to explore three very different elements of our collection. We could hardly start an exploration of rabbits in children's books with any other story, although through these books we discover Watership Down almost didn't get published, having been rejected by 4 publishers and 3 literary agents! This is a beautiful edition, created 4 years after its original publication in 1972, with John Lawrence illustrations in pen and ink with colour wash, and a fold out map of the warrens depicted in the story. We also discovered a thirty year old exhibition catalogue, with detailed descriptions of the all the material displayed in a special ten year anniversary exhibition of Watership Down. It has a brilliant foreword by Adams, shown below. Although we don't share this opinion of early manuscripts(! ), it is fascinating to know how some authors perceive their pre publication material. 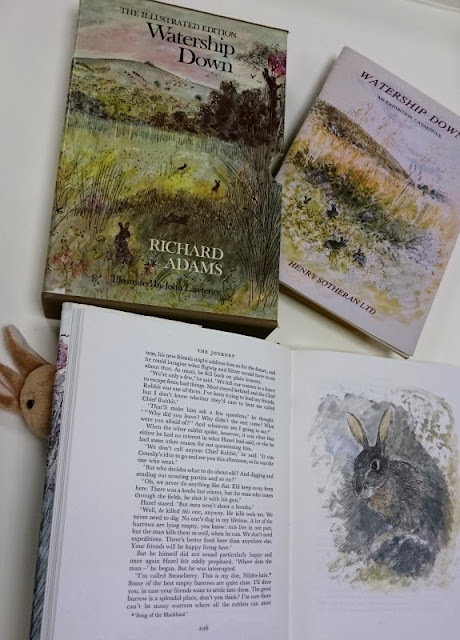 At the time of writing Watership Down, Adams was a member of the British Civil Service, possibly where he got his desire to always keep letters, no matter what. These books are held within the Kaye Webb Working Library collection, which runs to a staggering 2'346 books. 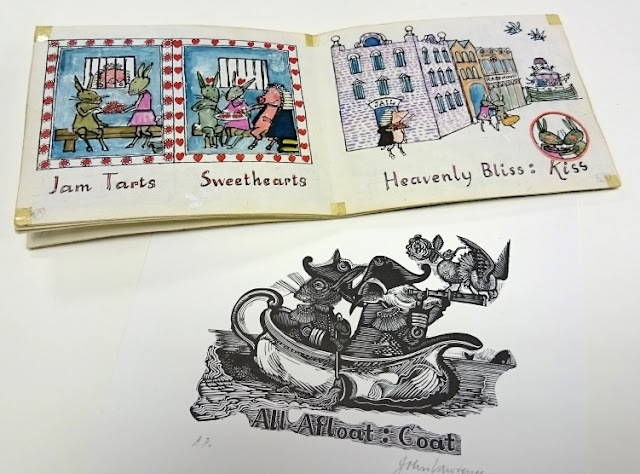 Webb was the Editor of Puffin books during the 1960s and 70s, exerting a major influence of children's books publishing, and it is fantastically useful to have her library here at Seven Stories to complement her archive. If you would like to find out more about Kaye Webb, search the blog or click here or here. During the early 1970s, John Lawrence must have spent a fair amount of time drawing rabbits, as the second item in this months series is also John Lawrence artwork! These fantastic illustrations for this unusual story showcase his distinctive engraving style, and are quite different from the above pen and ink illustrations for Watership Down. Held in the collection is a copy of the dummy book, and two final black and white prints. The story follows the adventures of our heroes, Rabbit and Pork, including various criminal activities, but all told in the format of descriptive cockney rhyming slang! In the above image, the change from dummy book to final artwork style is quite dramatic. We have many examples of dummy books within the collection, and this is a particularly well detailed one, in full colour throughout, suggesting it was possibly created later in the process, and near to having the final story. In the printed book, the story remains mostly faithful to the dummy, although there are frequent changes in page layout, possibly due to the change in medium from painting to wood engraving. The John Lawrence Collection held at Seven Stories shows a wide variation in his artwork style, from pen and ink drawings, watercolour, to layered wood engravings. Amongst several other books, we hold work by Lawrence for three Robert Westall titles (happily complementing our large Westall Collection), two books with Philip Pullman (Lyra's Oxford and Once Upon a Time in the North, also complementing our Pullman Collection, which holds material for other books in the Northern Lights universe), and our newest acquisition - Wayland, written by Tony Mitton (for which we also have ANOTHER complementary collection of the work of Tony Mitton, including two notebooks in which he wrote the text for this book). Also, for those who haven't yet twigged, 'rabbit and pork' is cockney rhyming slang for 'talk'! 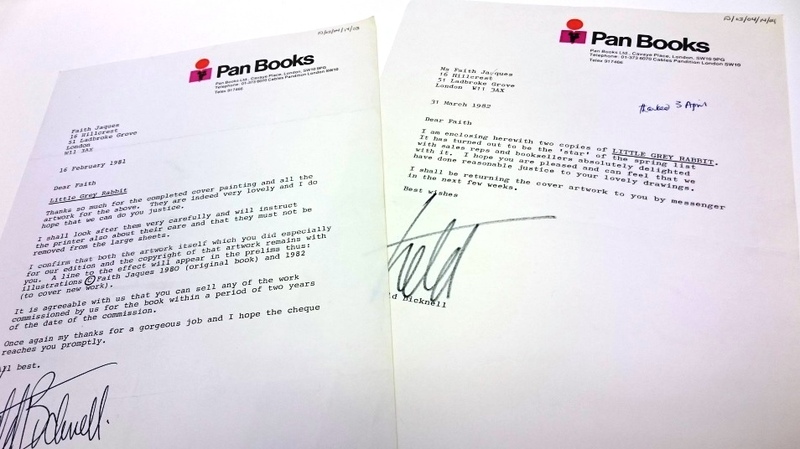 Correspondence between Treld Bicknell of Pan Books, and Faith Jaques, 1981 and 1982. Today's final example is taken from the archive of Faith Jaques, a dedicated illustrator with a long career in children's books. Here we have two (of several) letters between herself and her editor, Treld Bicknell of Pan Books, throughout the early 1980s. They refer to Jaques' new illustrations for a collection of Little Grey Rabbit stories by Alison Uttley, Tales of Little Grey Rabbit. They had originally been illustrated by Margaret Tempest, but had been out of print for some time. A note contained in one of the books in our collection tells us that the original artwork by Tempest had been lost, and the original printings weren't suitable for reproduction, being too 'dingy' to compete with other children's books on the market at the time. The tales contain - The Squirrel, the Hare and the Little Grey Rabbit, How Little Grey Rabbit Got Back Her Tail, The Great Adventure of Hare and The Story of Fuzzypeg the Hedgehog. All these stories were originally published between 1929 and 1932, and are amongst Uttley's most well known books. What comes across very clearly in the letters above is Jaques commitment to securing better rights for illustrators, particularly around image copyright. She has obviously written to the publisher to confirm she will be credited appropriately, and be given the right copyright line in the new editions. Sometimes illustrators would not be credited at all, or not be paid lending fees from libraries. It is also interesting to read that she is confirming her rights to sell the artwork from the book; for many years some publishers kept the original works of art themselves. Later in the series of letters, ironically, it turns out that there have been issues returning the artwork, and she only just received her work back in February 1983, two years after originally sending it. It is also interesting to note that over time, Tempest's original illustrations of the stories have been lost completely (if anyone does know of their whereabouts, it would be fascinating to hear!). The Faith Jaques Collection also comprises a beautiful collection of printed books, her working reference library with many much older than our usual collecting period. We also hold illustration work for more than 50 of her books, varying between final illustrations, alternative illustrations, proof copies, dummies and sketches. These include original alternative drawings for the first UK edition of Roald Dahl's Charlie and the Chocolate Factory. The archive also holds a series of correspondence and notes about the campaign for Public Lending Rights in libraries, and a small amount of personal papers and ephemera. *Full disclosure, I have two wonderful, and slightly pesky, rabbits - Mac and Horatio!